We’re all familiar with the ability of a lovely lawn to improve the aesthetic of your home. Whether you’re generally a neat freak or you just want to show off how your lawn looks, a lawn edger is one of the most significant gardening tools available to you. The beauty of your home is crucial; we get that. We’ve found the best lawn edgers to make this task a breeze, as well as some nifty guides to help you with your next purchase. 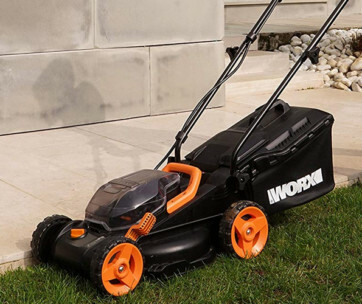 For some time now, Worx has built a reputation for being a leading manufacturer of all things garden and lawn-related. With the WG896, the company does a remarkable job once again. With a voltage rating of 120V-60Hz, this top-rated lawn edger is strong enough to take care of wider lawns. 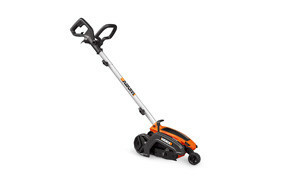 You’ll enjoy the robust feel of this lawn edge trimmer as well. Another thing that particularly strikes the eye with this baby is that it doesn’t sacrifice comfort for functionality. While 3-position blade and cutting line indicator will create professional cuts, you also get a pivoting handle and shaft that provide easy control while working. It’s an electric model, so you don’t have to worry about the toxic smell or potential for combustion that comes with gasoline tanks. The lack of a gas tank also reduces the weight of the edger, so you don’t need to stress over it so much. If you’re the type who worries about the validity of use, you’ll be glad to know that this electric edger has a 12-month warranty on the battery packs and chargers. Worx also offers a guarantee to replace or repair products that become defective within 3 years. For most people, this will definitely be one of the best grass and garden edgers. 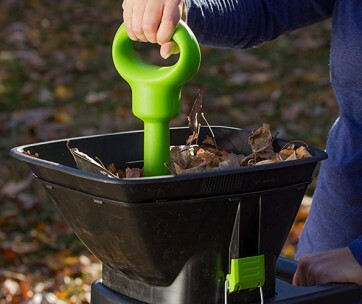 This makes a perfect gift for gardeners in your life. While the BLACK+DECKER LE760FFAM features as a runner-up in our guide, there is absolutely no doubting its efficacy as a strong option. Coming from accessory and hardware producer BLACK+DECKER, this product is the best bet for you if you’re looking to completely redefine your lawn. With a 12-amp motor, it will take care of any overgrowth and easily provide definition to your lawn’s shape. Also, just as it is with our top pick, control and comfort are assured thanks to the inclusion of three wheels; two at the rear end, and one in the front. There’s also a three-position blade depth adjustment, which provides easy control over the corners and edges that you work on. The lawn edger also comes with an exclusive pull-up guide, which makes for a smooth transition from a landscape trencher to an edger. This, in addition to the in-built cord retention, will ensure that the extension cord is kept secure. 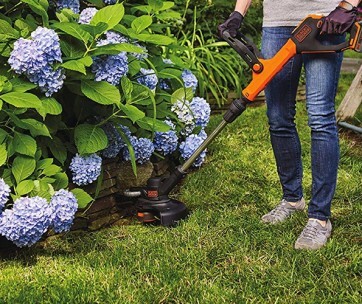 The edging mode on the BLACK+DECKER is a patented edge guide for straight edging along hard surfaces while the trenching mode makes it easier to cut through beds and shaping borders. Make sure you also check our guide to the best robot lawn mowers. 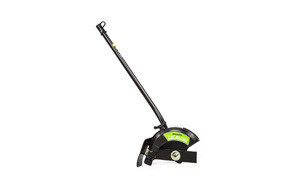 You’re going to enjoy Worx WG163 if you prefer a lightweight lawn edger. Just like a lot of other models, it comes with a 2-in-1 operating style that can be used for edging and grass trimming. You sure don’t see this every day. All of its styles can also be switched without the need for any additional tools. 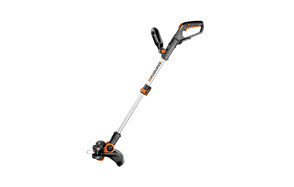 The edger is powered by a 20-volt MAX Lithium battery, and it uses a string trimmer to create a powerful and precise cut. Thanks to its 12-inch cutting diameter, it is able to trim in less time. For those days when you have a lot on your plate, but you just need to get this task done, rest assured that this tool will be your valuable companion. We’re also excited about the dual-positioned in-line wheels, which make it possible for you to edge your sidewalk comfortably. With the inclusion of a Max Lithium battery, you also won’t be able to worry about having to stop your edging for a quick charge. The battery reduces self-discharge time, and it is also space-efficient. What’s more? All of these functionalities don’t affect the edger’s weight at all. It comes in at just 5.3 pounds, and it is portable enough not to take so much space in your garage. Our handy guide to the best hedge trimmers features more great products like this. Poulan is a major manufacturer whose products have received widespread acclaim for their dependability. With the PP100E, you get a combo of a heavy-duty gearbox and a 7-inch hardened steel blade to provide effective trimming and edging services whenever you need. With an adjustable length of 2 inches, the PP100E is easy to install, and it also provides optimum compatibility with other reputable units, including John Deere, Homelite, Craftsman, and Snapper multi-tool attachment systems. Keep in mind that this tool is a lawn edger attachment. This means it doesn’t come with a motor or an upper shaft. These exclusions reduce its use for advanced gardening tasks. However, if you’re merely looking for something that can help with the basic trimming and edging, then this is a perfect fit. Love this product? Check out our review of the best cordless lawn mowers for our top picks. Another lawn edger that is easy to assemble and use. Measuring 35 by 12.5 by 6.2 inches, the Greenworks EDA75 fits all of Greenworks’ attachment-capable string trimmers. Cool right? The unit has a hanging hook for convenient storage in your garage or a storage unit (you know, if you need to free up space in the garage for that new car). It also comes with a 7.5” blade; no matter how “unique” your sidewalk is this edger will definitely work well for it. You get this, as well as the ability to eliminate any unwanted weed and grass sprawling onto your sidewalk. Find more great products like this by checking out our guide to the best riding lawn mowers. Features - Advances features are always welcome when it comes to lawn edgers. An addition of this means that they can be essential enough to provide the basic services, while also offering enough versatility to work in the stickiest situations as well. Comfort - With adjustable heights and other ergonomic features, these edgers come with enough comfort to be used by basically anyone. You don't need to worry about being too tall or short, and the edgers can also make accommodations for your type of posture as well. Price - Of course, this is a major sticking point for a lot of people. While it's true that you can't get proper quality without paying good money for it, you can rest assured that these lawn edgers won't put too much of a strain in your pocket. In addition to that, know that their relative affordability won't do anything to take away from the efficiency that they will provide as well. The size of your yard - When you draw up your list of yard edger qualities, the most important might have to be the size of your yard. You already know that an edger is used typically along a sidewalk, a driveway, or flower beds and gardens. So, if you have a property where the size of these "malleable" areas is large, then you will need to spend more cash on a much more substantial to make the job more comfortable for you. However, if your edging area is smaller, then a smaller lawn edger can easily accomplish the job for you as well. Got time on your hands? - Before you get an edger, you should know that task itself takes time (of course, the larger the area, the more the time taken). So, if you've got enough time on your hands, or you want to get something to help your gardener with the job, you can as well get a manual edger. However, if your time is limited and you want to get things done much faster, then an electric option is recommended. Again, if you have time on your hands, then you can also choose to purchase a smaller edger with smaller blades and a less powerful motor. A more advanced machine will be recommended if you need to make every second count. The social and environmental cost - With lawn edger machines, you an option of either the petrol lawn edger or electric-powered models. If you put a premium on speed and time, then the gas-powered unit is the right choice. However, if your yard is small and the edging task isn't so daunting, then you're free to choose the electric unit. Think of your budget - Now, it's time to pull out the wallet. Electrically-powered lawn edgers are known to be less costly; y can easily find one for about $100. With gas-powered lawn edgers, you can spend almost ten times this amount. So, what's your priority? You will need to spend a lot of cash if you have a lot of edging to do and you care about the perfect edging job. On the other hand, if you're not so concerned about the task (and your edging area isn't so large), you can let that reflect in the size of your budget as well. What's more? The best lawn edger for you might not be the most expensive one you find. For all you know, you could quickly get the best lawn edging service with an edger that provides only basic functionalities. In that case, splurging on all the advanced features might be a wasted investment. Power rating: The engine of the lawn edger will determine how much work it can do and how much time you will be able to save when you work with it. If your yard is large and you don't have so much time on your hands to work on your lawn, then you will need to spend on something that has a strong power rating. Wheels: The wheels help ensure that you can work on a straight line. If your landscape has a simple design and can easily be maneuvered, then you can get an edger with two wheels. More difficult terrains will need to be covered by an edger with three or four wheels. Height adjustment: Lawns are different in size and specification. With the height adjustment feature, you are sure to get a proper depth based on where you're edging and the type of soil around your area. Trenching mode: The task of trenching is to ensure that you can dig deeper into the soil and get rid of roots. Many edgers have this functionality, and it makes them much more versatile. Scoop-end blades: If you're working around an area with mulch cover, then this is definitely the right blade option for you. Star blades: The star models work between 3 to 8 points. The shapes work especially when you're working close to hard surfaces like retaining walls. You can also use the blades for some mild aeration work. Walk behind edgers - Walk behind edgers are wheeled lawn edgers. It's as simple as that. As opposed to carrying your edger around or bending down to work, these edgers provide operational versatility by incorporating wheels. This way, you can walk and trim your lawn's edges without stress. Think of it like using a lawnmower. In addition to this, many manufacturers of walk behind edgers provide the height adjustment feature that lets the edger easily adjust to the posture and height of the person handling them. Added versatility that way. Hand-held, battery-operated edgers - The hand-held option is pretty basic. It might be easy to use, but the problem with these edgers is that they could be a bit too uncomfortable; especially if you're too tall for the edger. Having to bend down- particularly in a situation where your lawn or sidewalk is extensive- is definitely not fun. Manual vs. Electric Edgers - Usually, lawn edgers come in either gas or electrically-powered options (we mentioned this earlier). The gas-powered options come with a compartment for putting fuel that runs them, while the electrically-powered options just need to be charged and used accordingly. Which Should You Choose? - All in all, the option that you choose will usually depend on you and the type of task that you're running. If you're a tall person and you're worried about the comfort of having to bend down for long, then you really shouldn't be using a hand-held edger. However, if you find a portable edger that meets your need, there is absolutely no reason why you shouldn't give it a try. As for style, there are so many differences between the gas and electrically-powered options. You can easily peruse the features section to see which appeals to you and draw up a pros and cons list for each to guide your purchasing process.